Notes from her son Bradford L. Meinecke -- July 2016. 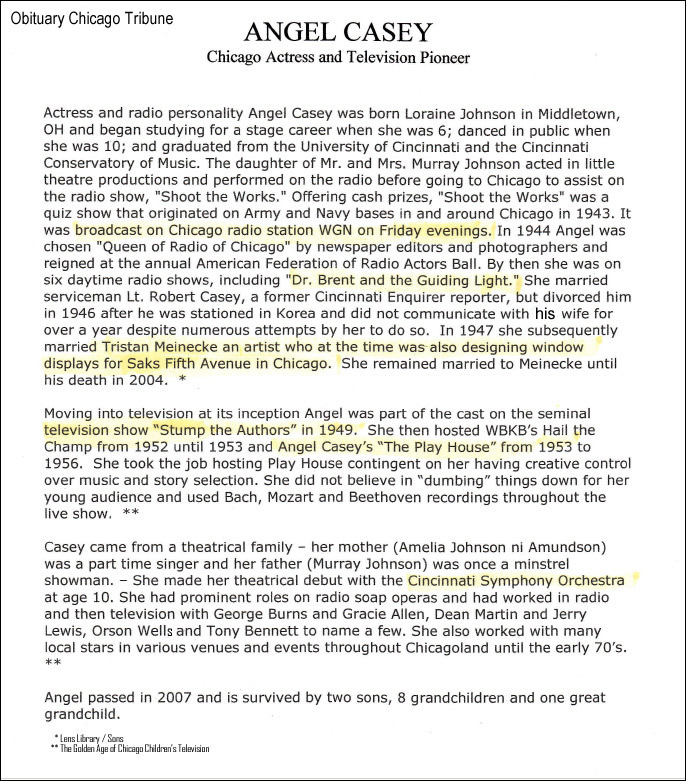 Angel Casey was an accomplished actress who attained Chicago regional star status -- there is much information on her in this site. However, the purpose here is to describe events that revealed who she was at the core of her being. Central to these were the cultural norms, and the politics of race in America prevalent in the middle of the 20th century. Any discussion of Angel Casey without mention of her husband and life partner Tristan Meinecke would be incomplete. Thank you for reading. 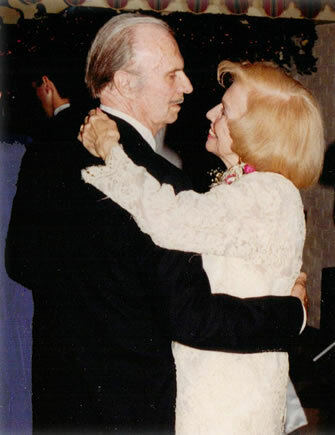 My mother and father, Lorraine "Angel Casey" Meinecke and Tristan Meinecke were two of the most unusual people I've ever met. For one thing, both had ample opportunities to sell out their values for incredibly large amounts of money -- Neither did! This fact alone makes them rare individuals, and in my opinion American heroes, but I'm biased. They had their flaws, they made mistakes as we all do, but they stayed absolutely true to what they perceived as right (and to each other) until the very moment of death. Race was important to them, but not in the manner it was to their peers. They knew unequivocally, that judging anyone on race was idiotic and very, very sad. Tristan and Angel revered African American contributions to Jazz (among other things) and knew many musicians personally. Angel was good friends with Lil Hardin Armstrong who at that time was the house pianist at the hottest club in town called "Dreamland" where Tristan often played clarinet and saxophone. The list goes on, but the point is they KNEW the racial injustices of their time were absurd, sad, destructive, and inarguably evil. These policies personally offended and saddened them. They wanted the policies to change. They didn't just "think" this, or "talk" about it, they acted on their beliefs in very public fashion. Tristan, to the horror of the existing white residents of Lincoln Park, rented to African American friends in 1962 at the 2022 N. Cleveland building. In the late 40's and 50's, he played music with people he knew were geniuses who were also African American. He once told a white musician who had asked how he could play with those "animals" that the people he played with had IQ's greater than the questioner and his whole family's combined -- so therefore perhaps he was the animal. Angel, though, went straight at the problem as soon as she thought she had enough power to pull it off. It turned out that she thought so incorrectly; but no matter, once she took her stand she never looked back, and never backed down. In 1956 she struck a hammer blow for diversity from deep within the halls of media power. In so doing she sacrificed a burgeoning national acting career and created a virtual tsunami inside the belly of the beast. She never spoke of it, in fact quite the opposite, she just did it! When the chips fell against her, which they did, she squared her shoulders and continued her career and living her life as she knew it should be lived. To her way of thinking, she was right, they were wrong - period! That's the difference -- To "Tris and Angel" these issues were about right and wrong in the largest, most powerful sense of these common words. They said judging people on race was bad not only for its victims but for the country as a whole and should stop immediately. They saw the racial policies of the day hurting millions of people. They saw people they knew and liked, people who should have been considered incredible humans beings, mistreated, abused, and killed routinely and systemically. They knew that was wrong and was not how life should be lived. They passed their beliefs forward by instructing their children that the only way to judge a person was on their character and intelligence -- in that order! They were very clear on this a decade before the great American hero, Dr. Martin Luther King taught essentially the same thing. Understand, they were not cause-oriented people -- though Angel did advocate for children -- they were far too busy to champion causes other than their own. It is because of the way they both saw right and wrong that they were decades ahead of most on racial and gender equality, and other issues. (Angel would argue this point, as she reveled in her femininity and didn't like the sometimes rough and tumble feminist's of her time, but if asked a specific question about an issue like equal pay, reproductive rights, etc., her answers would be far ahead of her culture). Angel and Tristan lived, loved, and then as we all do, died. Both were ahead of their time, left large legacies, and had a significant impact on our culture -- Tristan in art, music. and the over 800 units he and Robert Bruce Tague designed in Lincoln Park. Angel in theater, radio, television, and in the joy she brought to countless kids. Her greatest artwork though was herself -- she excelled at the incredible art of being Angel. Unflappable, unapologetic, with the will of the Viking warriors from whom she descended. In a statement of fact, she was the most indomitable person I have ever known and I've known quite a few. Truly. the story of Tris and Angel is a classic American love story -- they were together for over half a century, basically back-to-back, come hell or high water, them against the world. In their opinion, they won! They did not compromise their core values, or fail to live a full, productive and generally happy life. There were ups and downs of course, but they never sold out, gave in, or gave up, and they were always loyal to each other. For this, as one of their sons, I am personally proud as are the rest of their progeny. Their beliefs and life stories will continue to be passed down, generation to generation, as the family treasures they are -- As Angel would say: "May it be ever thus!". Play it straight, play it true.